Yet again another excellent month for video entries. Loved watching them all. Especially good to see a few basic videos as well as the more polished. As usual please do read my comments made to others as well as yourself as this may well help you too. You have certainly dived in some wonderful places and seen some stunning wildlife. Very nice film with emotive music. It was good to have the change of pace half way through. Camera work is excellent with well exposed, sharp, well framed and steady shots. The ray settling on the gobi was great, as was the trigger fish eating the lionfish. Had the lionfish been speared? The seal climbing the steps was perfect. Everything was right about this film. The music, the subject and the way it was filmed. The turtle turning was magical and the mid shots of it on the drop-off were lovely. Then you decided to go wide. May not have been shot that way but in the edit order it was perfect. It gave me a real sense of place. A powerful glimpse at the world of the turtle. You did well then to keep the shot running and maximized your luck when the turtle came back towards you and up into the bubbles. Lovely. Thanks for the explanation of Chelone, that was a nice touch. Hi Dean, Dive Shack must be pretty pleased with that. Nice graphics to open with. The aerial shots mixed well into the underwater where the fish around the pier were quite spectacular in the shafting sunlight. Sea horses were stunning as were all the other clips. The music was good and you did some nice editing to the beat. The macro shots really are superb. The opening rib journey was a good introduction and the seal nosing the camera on the surface was delightful. You certainly had a great encounter underwater. The seal mouthing the divers leg made me laugh out loud. Made me long to be back in the water with seals. The music was nice and the images were all well filmed. Spectacular opening. The music really caught the mood. The images were perfect and just got better and better. A real joy to see. Took my breath away. Lighting was exceptional. To think that all seas and oceans were like that once. The macro in the jellyfish was great and just when I though it was all over the music started to crescendo and ‘bang’ in came the whale shark. All beautifully filmed and edited but, had it been me, I would have finished with the shark as the bat fish were a bit of an anti climax. What a perfect opportunity for a film. Wonderful how quickly life will colonise if given the chance. Slow motion opening was very good but I personally found the music a bit over dramatic for the images. Your underwater camera tracks and moves are very good indeed and extremely effective. Hi Carol. That was fun. Haven’t had an entry quite so short before. Never the less it was nice. A complete little story in ten seconds. Ah! Another Moray. Wondered what it was going to be. Quick tip. If you are using a fixed focus camera such as a gopro, try to remember the minimum focal distance, which is just how close you can get before the subject becomes unsharp. In this instance the second Moray was too close when you tilted down, so to compensate you could have eased the camera slightly further away. Hi again Carol. That was a good find. As with the Moray, there was an issue with the first part of the video being out of focus. Sometimes, if the subject is so good, then an audience will forgive this and this was one of those occasions. Another tip. With a fixed focus lens, rather that trying to get too close, keep the shot wider to keep it sharp and then zoom in slightly at the edit stage to make the subject larger. This will keep it sharp. Or, perhaps think about getting a close-up attachment for your camera. One that you can slip on and off while underwater. Hi Sheen. Tricky things to keep the lens on, Octopus. You did well. Have a look at the comments I made to Carol about minimum focal distance. May help you too. It’s always tempting to get as close as you can to wildlife, especially octopus, but after you have a few good close-ups think about taking a slightly wider shot to help set the scene. 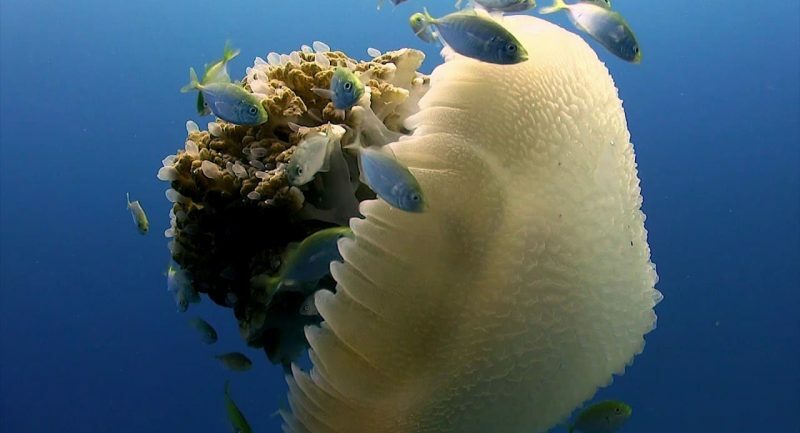 There were three videos that stood out this month but there can only be one winner, so I have chosen One day at Sail Rock dive site, Koh Tao, Thailand by Istvan Zoboki. Of course the location was spectacular and perhaps a bit unfair on those confined to less rich waters, but I do usually take this into account. On this occasion I have to admit the location did help as did the incredible abundance of fish. Having said that Istvan took full advantage of both the location and wildlife to shoot and edit a dynamic video. Well done to everyone and look forward to next month.